Two queen sized beds for families. The bathroom with piping hot showers. This tent has been designed and furnished so as to ensure total comfort and luxury. 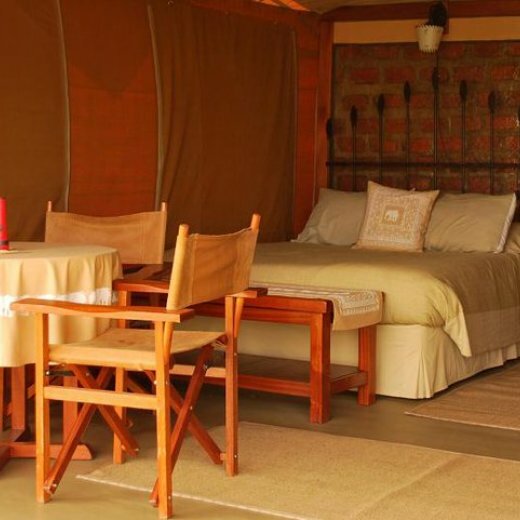 Each tent has two large, comfortable queen size beds, an absolutely attractive en-suite bathroom and the most stunning view of the Mara below from the individual verandas. Surrounded by Savannah, Mara West Luxury Tents provides nature lovers with luxury accommodations while experiencing the sights and sounds of an unforgettable African safari. The luxury tents are perched in secluded spots on an escarpment edge overlooking the vast plains of the Masai Mara National Reserve, giving tremendous views and a sense of private exclusion. Mara West is an American owned and managed private safari camp providing high quality service with beautifully designed, comfortable accommodations. Associated with the non government organization (NGO) Africa Mission Services (AMS), Mara West Camp provides financial support that enables AMS to carry out its ongoing development program in the local Masai community. There are only six luxury tented rooms; all of them are tastefully designed to provide guests with the utmost comfort and luxury. 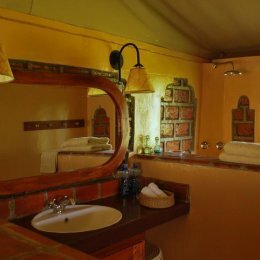 Each tent is furnished with two queen size beds, an elegant en-suite stone bathroom with traditional shower and flush loo as well as its own individual veranda facing the breath-taking view of the plains below. 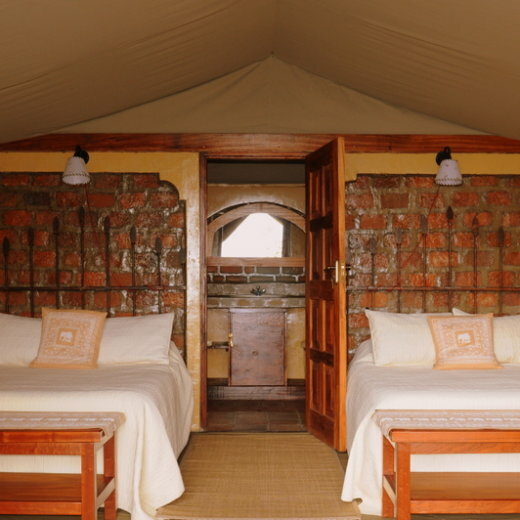 The luxury tents can accommodate up to 12 people, with 2 people sharing. These tents have been designed and furnished so as to ensure total comfort and luxury. Each tent has two large, comfortable queen size beds, an absolutely attractive en-suite bathroom and the most stunning view of the Mara below from the individual verandas. With a fully equipped kitchen and professional chefs, Mara West is able to spread the table with tastefully prepared, appetizing dishes of many varieties. A wide range of tastes, including vegetarian dishes, can be catered for. Various soups, creative main entrees, plentiful fresh fruits, salads and vegetables and home cooked pastries, breads, and desserts are freshly prepared. Cultural tour to the local Masai Boma. Tours and introduction of local schools and their activities.